Around midsummer Joe Cornish, David Tolcher, Andrew Nadolski and I decided we'd set ourselves a little challenge to turn up at the same location with a bunch of cameras and see what happened. As David Tolcher has a house in Robin Hood Bay we chose Saltwick Nab as a great location as the sun sets off to sea in the North at this time of year (well - North West obviously but that's up the coast in these parts). Each of us had about three hours to take a look around and to explore the slate bed just offshore where the wreck of the Admiral von Tromp sits alongside reflecting pools and the graphic outline of Saltwick Nab. Read about our experiences below.. When you have visited somewhere countless times before, the main challenge would appear to be, how do I not repeat myself? In fact, the North Yorkshire coast shorelines are so dynamic that literally repeating oneself is virtually impossible. Even Saltwick's giant sandstone blocks that I know well from the western side of the beach seemed to have been upturned and repositioned in the winter storms. 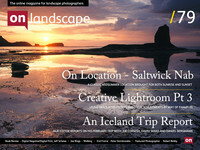 The sea stacks, Saltwick Nab, and Black Nab seemed familiar enough, but all the details on the beach seemed different.